An A La Carte option allowing you to pick and choose your classes and ice time. Paying only for what works for you on a daily or registered weekly basis. Bag or Buy your lunch. Pond Snack Cards are available and Snack Bar is open. On Weds. we leave the Pond for an afternoon of fun 12 -3pm. Each week we will announce our adventure! Movies, swimming to name a few. Weds is included in Full Day Camp. All others will use a punch or pay $12 for Weds. activity. Bring $ for snacks and Ice Cream Truck on half day Friday. Pre Register A La Carte $12 per or $10 with Punch Card. Best Price is Summer Camp Punch Card $200 for 20 classes or sessions. Makes everything you do $10 per. Recorded at Desk & Only valid for summer camp & Freestyle from 6/4 – 8/9. Our new Open Gym Sessions and Off Ice Harness gives your skater and Coach access to a training most anytime. 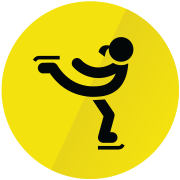 On Ice Descriptions: Freestyle Session: Practice / lesson time for figure skaters. Contact your coach to schedule your private lesson time or take advantage of Freestyle time to get extra practice time. *Your Coach will be coordinating their own small group Moves In The Field lessons during these times. Power Skating: Refine your edge technique and gain endurance with Libby Treu or Kris Fondran who will put you through the paces. Yoga by Julie Gable: specifically to the needs of figure skaters. Each class is designed to enhance performance focusing on flexibility, strength and balance. Open Gym Session: Coordinate with your coach and set up a daily open gym time to work on cardio or strength in new fitness room.